The best hiking backpack for you can make or break your next trip. We all want the perfect pack that is comfortable, organized, light, and rugged. With summer 2018 right around the corner, we have several hikes planned and can’t wait to get into the mountains and on the trail. We searched for months before we nailed down the best hiking backpack. There are so many online and in outdoor stores to choose one or the right one can be downright daunting. There are so many things to consider when buying a trekking backpack. This collection of backpacks all excel at overnight and multi-day treks. They’re leading in class for comfort, durability, organizations, and most importantly weight. This is the pack Cameron carries and its treated him exceptionally well. The Atmos has two size options with a 50L and 65L that should fill the need of most needs from short overnights to extended treks. Don’t be afraid to load the bag up as I can carry 40lbs and it still sits comfortably on my back. This top loading pack has a removable floating top lid that can be utilized to lighten your load. As well as an internal frame and side compression straps that when combined with its anti-gravity back panel make for great weight distribution. I also love the dual front paneled pockets, a mesh area for dirty shoes, and straps for your tent poles. To back it all up, Osprey has one of the best guarantees in the business. They have been designing great bags for years now so it shouldn’t be any surprise they make one of the best hiking backpacks on the market. Cons: Only top load access and it does not sit up right. It seems silly but with only a top load it’s a PIA. 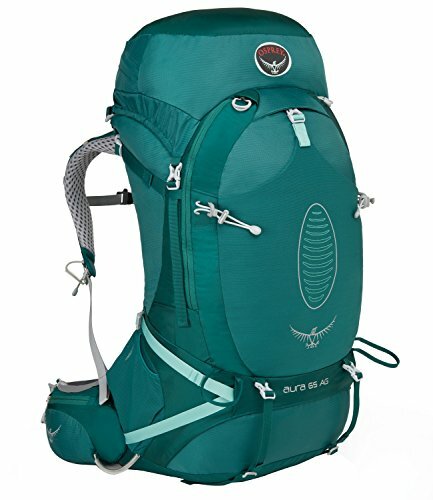 The Osprey Ariel is the perfect women’s trekking backpack. It’s a great all around bag built to fit a woman’s torso. Made of Nylon ripstop material it comes in two sizes 55L and 65L. Complete with a custom fit and interchangeable IsoForm5 harness and even a padded hip belt the Ariel is great for long hikes. Its Anti-Gravity technology is throughout the entire back and can be found in the lightweight mesh material in the upper torso and lumbar area. My favorite feature of the Ariel is the convertible top lip day back which can be removed if you want to climb a nearby peak without the entire pack. The pack has trekking pole attachments and hydration sleeves to keep hydrated. With their LightWire peripheral frame, the Ariel is also one of the lighter backpacks on this list. 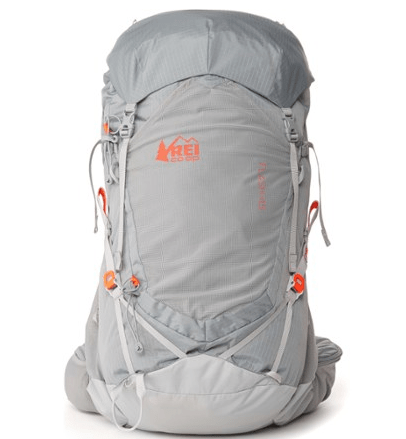 We love to shop at REI and love the gear the design. It’s often a great value and we’ve personally used their backpacks for years. The Co-Op Flash Pack is made out of ripstop nylon and is a great 45 L trekking backpack for both men and women. With 45L it’s manageable for a gear-heavy day hike or even an overnight. The REI compression technology helps keep your belongings up and in to help your balance, stability, and posture while hiking. Its super lightweight frame is great and really appreciated on the trail. There are attachment loops on the front to allow ice axes, poles, and other tools to be stored as well as snappable water bottle pockets on the hip belt. The mesh back panel allows for airflow keeping you cooler when walking in the sun and the removable top lid offers customizable pack volume. We think this pack is perfect for those on a long weekend hiking trip in the mountains or on cross-country trails and has even been named the “Best Women’s Fit” backpack by Backpacker Magazine. This durable top hiking back is one of the cheapest on the market and is suitable for men, women, and even children. The internal frame makes the Teton an excellent choice for camping and hiking. Even though this pack is well under $100 it still has sturdy zippers, open-cell foam lumbar pad support, and extra padded waist and shoulder straps. There are loops for your ski poles. Although this pack is not waterproof it comes with an integrated rain fly for when you get caught in a downpour. There is no bladder included, but there are side holsters to place your water bottles while trekking. In our opinion, this pack is one of the best packs you can get for your money. It might not be the right fit for serious hikers, but those just getting their toes wet will love its affordability. This is easily one of my favorite packs on the market. The material in this bag has allowed for weight previously not seen. It’s impressively strong, super lightweight, and close to waterproof. Hyperlite Mountain Gear specializes in building outdoor gear with this special material called Dyneema Composite Fabric. Their backpack line comes in a number of sizes, but the 3400 is their middle of road backpack with 55L of storage. If you’re big on buying American made this company is based and manufactures in Maine, bonus point. The higher price point may deter some, but it comes with the territory of buying top of the line materials. If you do purchase expect these packs to last for years of heavy usage. Weight: 2 lbs. 0.6 oz. 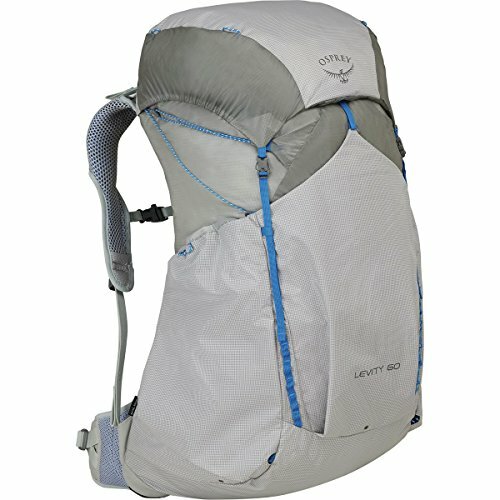 This is Osprey’s answer to the wide range of ultralight packs popping up everywhere these days. The bag weighs less than 2lbs which is pretty amazing while still providing you with a metal frame. Like most Osprey packs it has a solid construction. Despite its lightweight build, the bag is surprisingly robust and the straps sit well on your shoulders and back. The vented back ensures you don’t overheat when carrying the pack. Cons: Like the Atmos it falls over and is top loading. Gregory has been building bags for a long time so they know how to build a quality pack. This hiking backpack is a workhorse designed to be used and abused. The Baltoro is designed to carry a heavy load without breaking your back on the trail. It has a nice suspension system with plush padding and great organization. A comfortable mesh backpack makes for good ventilation and it has great features like a built in rain-fly. It’s still a heavy pack, but with the quality of the build and heavy load capability it’s a strong backpack. 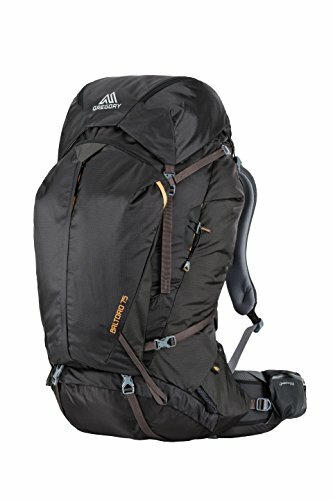 Pros: With a large capacity and great suspension you could live out of this pack. How to Choose a Good Hiking Backpack? The first thing to think about when it comes to picking a great hiking backpack is your budget. Good quality backpacks are expensive, but you also don’t want to blow your entire budget on a backpack. However, if you invest in one of the best hiking backpacks on the market chances are it will stand the test of time. Many companies like REI, Osprey, and The North Face will offer to repair your products. Like with anything, make sure that the hiking backpack you choose is comfortable on your back. You should be able to hike comfortably for at least two hours. When buying online it’s a good idea to check the return policy in case the backpack does not fit you the way you would like. A hiking backpacks design capability is crucial. A good backpack doesn’t necessarily mean a bunch of bells and whistles. Make sure you narrow down if you want a top loading backpack or front loading, and check for any extra straps, harnesses, zippers, and clips you may or may not want and need. Make sure you pick a hiking backpack that is made out of good material. Most backpacks are made out of either Ripstop Nylon or Dyneema. Dyneema is generally more expensive since it is lighter, but both are extremely durable. Determine everything you will want to carry in your backpack for that will determine the volume bag you buy. A good starting point is 40-50L. You’ll want to choose a relatively lightweight backpack since you will be hiking with it for long treks. A backpack can easily be your heaviest piece of gear so choosing something lightweight could make all the difference for your comfort. And finally, choose a frame that serves its purpose for what you need. If you are carrying a lighter load then a lightweight frame is a great option, same goes for the opposite. It’s important to consider your trip length when picking a hiking backpack. There are great day backpacks on this list that are great for just that – a day. While others can serve you well for hikes longer than a week. 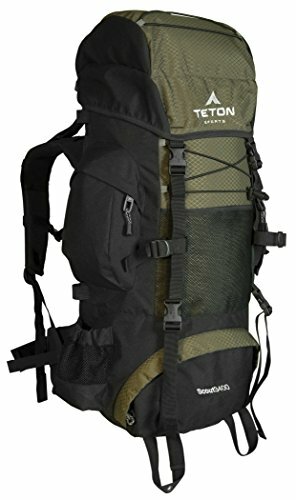 Elements of a Good Hiking Backpack? Main compartment: You’ll want to make sure that the main compartment of your backpack is large enough to carry all of your belongings while still having easy access. Store the heavier things at the bottom of your bag so that the weight is closer to your back. Small compartments can be good for storing little extra items, or they can just get annoying if you don’t find that you need them. Trekking pole/ice picking loops: These are great little additions to any bag that can really optimize your comfort and free your hands if you use poles or ice picks on hikes. Shoulder straps: Along with the hip belt, your shoulder straps carry a lot of the weight of your pack. Thick and comfortable padding will keep your shoulders from hurting after a long days hike. Hydration Ports: We use a bladder when we hike, so a pack with a hydration port is absolutely essential to us. Most hiking and day backpacks have this now, however, if you don’t use a bladder then this shouldn’t be a factor in your purchasing decision. Water bottle holders: If you aren’t using the hydration ports or a bladder you will want at least one water bottle holder to hold your liquid. Waterproof: We look for bags that are waterproof or have a rain fly. Nothing is worse than wet gear. New products like Dyneema are fantastic for their waterproof and lightweight capabilities. Hip Belt: A good hip belt is essential for any trekking backpack. Putting the weight of your backpack and gear on your hips helps take the pressure off your back, so you will want a good, well-cushioned hip belt that is sturdy to help do that. Cushioned back: A well cushioned back panel can make the difference between having a backache or not. Osprey: Osprey undoubtedly makes some of the best travel backpacks on the market. All of their products are backed by their All Mighty Guarantee and have no BPA or PVC. Arc’Teryx: Arc’Teryx is a Canadian outdoor supply company founded in 1989. They use high-quality materials in all of their products and back them with the Arc’teryx guarantee. Teton: Teton Sports is run out of Utah and is another brand well-known for their outdoor gear. All of their products have a limited lifetime warranty, backed both by Teton Sports and the store where the product was purchased. The North Face: North Face products have, for years, been tested against the harsh conditions of nature around the world. They feature the latest technology in all of their products, with many backpacks even standing the test of time. They also launched their Responsible Down Standard, a global nonprofit dedicated to sustainability in the apparel and textile industry. Deuter: Deuter is a German company that specializes specifically in backpacks and accessories. They make durable products that last and pride themselves their commitment to social responsibility. Mountain Hardwear: Mountain Hardwear prides themselves on the great performance of their products and has for the last 20 years. They make great products and backpacks all backed by a limited warranty. REI: REI is where I get the majority of my outdoor gear. Everything in their store is backed by their 100% satisfaction guarantee. Since 1998 they are have consistently been listed on Fortune’s “100 Best Companies to Work For,” and they give back millions each year to conservation. Like with anything, choosing the best hiking backpack really depends on the intent. Are you going on a short hike or a multi-day hike? Would you like a backpack with many compartments and bells and whistles or is simpler better for you? Most importantly, is the backpack comfortable? Everyone is built-in different shapes and sizes and what’s comfortable for some may not be ideal for you. I like to use my REI Flash Pack because it is light and fits on my womanly frame extremely well. Cameron takes hiking more seriously in the mountains. He loves his Osprey Atmos because it’s tough and built to last, carrying all the weight well, and he knows that Osprey comes with a lifetime guarantee on their products.